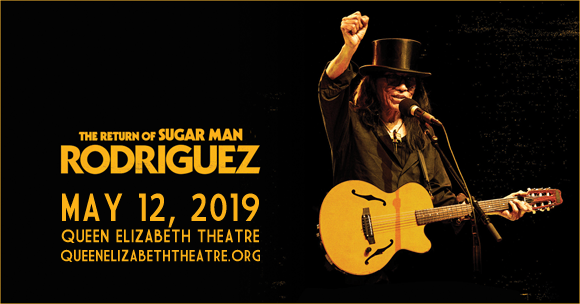 Renowned singer-songwriter Rodriguez returns to Canada on tour this year, heading to Queen Elizabeth Theatre on Sunday 12th May 2019! The equally enigmatic and iconic performer will perform songs from his seminal albums Cold Fact (1970) and Hard Reality (1971), demonstrating his impeccable ability to craft timeless tunes that call to hearts the world over! Don't miss your chance to see this bona fide legend live! Hailing from Detroit, Michegan, American singer-songwriter Rodriguez is best-known as the subject of the 2012 Academy Award–winning documentary film Searching for Sugar Man. During the late 1960s and early 1970s, Rodriguez had a short-lived music career in the United States, but soon retired and returned to demolition and production-line work. Concurrently, his music had become enormously successful in South Africa (as well as Australia, Botswana, New Zealand and Zimbabwe), where several of his songs served as anti-apartheid anthems and where he is believed to have sold more records than Elvis Presley, but the artist was entirely unaware. Due to the political climate in South Africa, little information was available on Rodriguez and a pervasive rumor spread that he had died after the release of his first album. In the 1990s, a group of South African fans found and contacted Rodriguez, which led to his unforeseen return to music, and a further career boost in 2012 when the documentary increased his popularity in the US. Rodriguez's albums Cold Fact (1970) and Hard Reality (1971), were reissued in 2012 and have become internationally renowned.